Catherine Thompson is one of a growing number of farmers who sees the benefit in commercial and environmental farming working together hand in hand. Catherine took over her father’s farm Holme House in Yorkshire over 20 years ago. She has both arable and beef on her 1,000 acre farm, with 50 pedigree beef cows, a pig unit and also the production of sugar beet and barley at the local mill. At her farm Catherine has a number of environmental measures in place, she says: “There is a river running through the farm with a significant number of wading birds that live there and we have recreated a wetland meadow on riverside areas of the farm where the cattle are grazing. We feel really strongly about the environment and believe it is really important that their environment is protected and enhanced “On the farm we also use bird boxes and bat boxes, and plant small corners with seed bearing plants for birds, bees and insects. We also have a network of bridleways and cycle paths through the farm and an Educational Access Program whereby school children and other groups can come to visit the farm for study purposes or for general information about what we do. 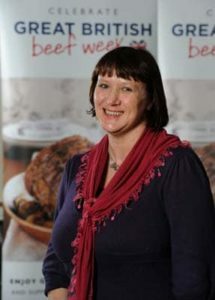 Catherine has also become a champion of Ladies in Beef which was co-founded by two beef farmers, Minette Batters and Jilly Greed, who hold a passionate belief that the general public has a right to know about the people producing their food, the exacting standards, and the high quality and care that these farmers maintain.